Strong leadership and clear communication were key elements in ensuring that upgrades at the University of Florida student union created minimal disruptions to the facility’s activities and operations. The result of the retrocommissioning and master plan processes at University of Florida’s J. Wayne Reitz Union was an expansion that added a wing to the building and renovations of 80,000 square feet of the existing structure. The project, which started in 2014 and finished in 2016, included a number of energy-saving measures, one of which was replacing all incandescent and fluorescent lighting with LED fixtures. Mironack and his team opted to undertake all of the projects simultaneously over two years instead of stretching out the work over a longer period. “We did it all at the same time, which was a positive and a negative,” he says. “The positive was that we got it all done and out of the way. The negative was that the level of chaos was even greater. Renovations and upgrades inevitably disrupt operations the operations of any facility to some extent, so Mironack opted to minimize the length of the disruptions while keeping their scope to a manageable level. 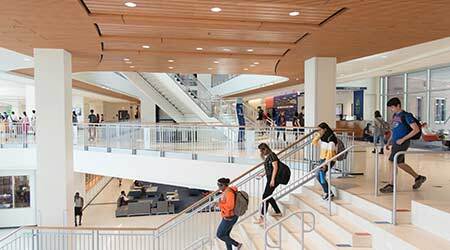 Among the high-priority projects included in the renovation and expansion of the University of Florida’s student union was a lighting system upgrade. The upgrade to LEDs was a major element in the project and an important energy-conservation measure. “Changing out the fixtures and adding both light sensors and motion sensors in key areas allowed us to automatically turn off lights when they weren’t needed,” Mironack says. “We also standardized our lighting inventory. We went from hundreds of different types of bulbs in inventory. While most of the lighting upgrades went smoothly, technicians did encounter an unexpected challenge.